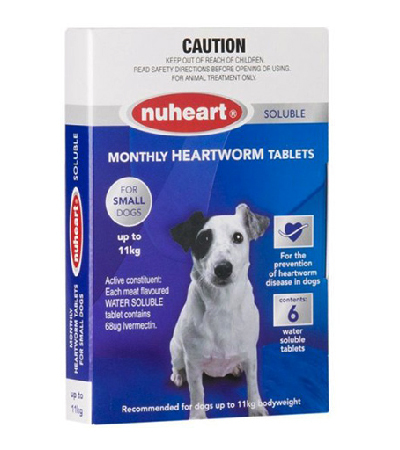 NUHEART Heartworm plays an important role in dog heartworm. Australian made, APVMA Registered, proven and trusted in heartworm prevention with wide acceptance by dog owners in Australia and overseas. NUHEART's small size, across the entire range, ensures easier dosing and less rejection. NUHEART's meat flavoured base is attractive to dogs and makes it easy to administer. For the fussy dogs, NUHEART can be dissolved quickly in a small amount of water and mixed in the pet's food. Administer one tablet monthly for complete heartworm protection.